Security fences are unwound and drilled in the snow with hurried precision. A team of snowmobilers decked out with safety vests and caution flags sit poised, ready to transport materials and persons uphill as needed. 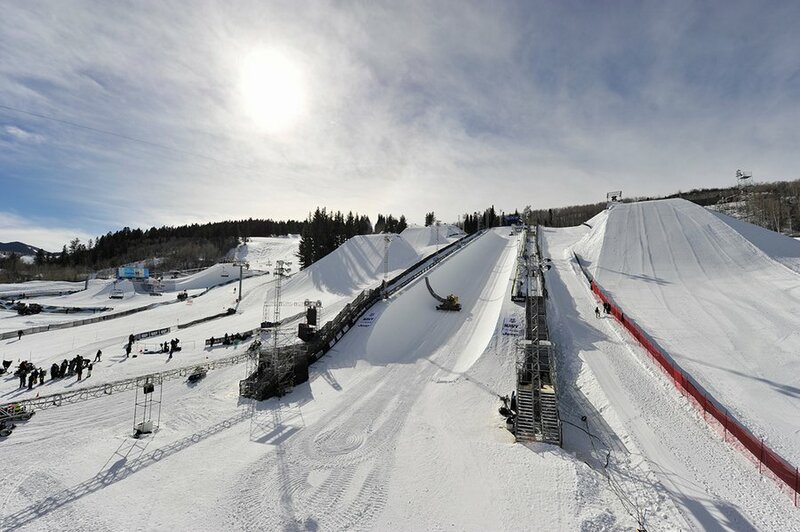 Above it all, the jumps of the slopestyle course and big air loom. I’m greeted at the bottom of the pristine Superpipe by Chris “Gunny” Gunnarson, founder of Snow Park Technologies, and led to the Prinoth Bison XPT cat near the base of the big air jump. He opens the passenger door for me and I leap into the seat, armed with a slew of questions about what it takes to build the course for this massive, televised shred festival. Now in it’s 18th iteration, the X Games is regarded as the pinnacle of endemic snowboard contests, helping to define the direction of modern-day shred events. The contest takes over Aspen, Colorado January 22-25 as it has for the last 14 years with over 220 athletes competing in Superpipe, slopestyle, big air, snowboarder X, snowmobile, and adaptive events in which handicapped Special Olympics athletes will compete Eight different courses have been constructed and will be the scene for all of this action. 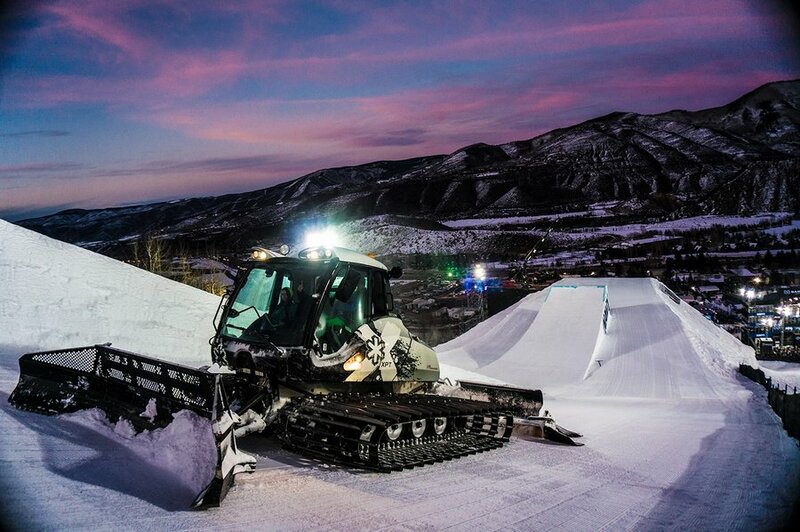 Snow Park Technologies has been building and meticulously curating the X Games courses for the entirety of the event’s existence, and their initial work on the first X Games in 1998 helped mold the company into the leader in park construction. Gunny fires up the monstrous machine, which SPT helped develop and can retail for up to 275,000 dollars, and we lurch forward, crawling up the side of the slope course. It boasts plenty of high-tech features including an inclinometer and digital measurement device for precision in park design, a 110-volt power inverter for grinders or saws and a badass sound system. This cat was used in the production of Dew Tour last month, will be trucked to Vail create the courses for the Burton US Open, and will also be used to develop this year’s Peace Park. Gunny has helped build all of the X Games courses in its historic 18 years, with each course differing from year to year. We continue upward, the massive big air jump rising to our right. The temperature is near the high 30s, which has been standard in Aspen this early season. I ask if the unseasonably warm, early-season temps and lack of natural snow had any affect on this year’s build. Though exact numbers couldn’t be provided, Aspen is on track for blowing the same amount as they did last year, and they are done blowing for the season. This year’s snowmaking efforts did differ from last year’s in that they had to make more snow, more quickly. The Aspen/Snowmass park crew takes extra care processing the snow they use for the Superpipe as they near the end of the build so they can create the best possible conditions for the competitors. Unfortunately, since time was tight, they weren’t able to let the man-made snow cure, or dry out, which made the building all the courses a bit trickier. As we near the top of the slope course, several diggers meticulously shape the newly set jibs, leading me to wonder what the biggest obstacle was with this year’s build. “I think with this year, and every year, it’s creating venues that really allow the athletes to shine and showcase the utmost level of riding,” says Gunny. “It’s crazy because this year so many guys, maybe 75 percent of the men’s slopestyle field have a triple cork, or a couple variations of the trick. Whether you like triples or not, it’s a progression of the sport, and we built a course for these guys to really shine. I personally think the jibs are a big differentiator because so many of the athletes have such incredible jump tricks, so it often times comes down to the jib section. 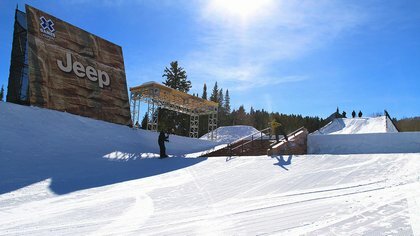 We built the course so slopestyle shines as it’s intended to, to be a creative use of the course, and not anything stock or standard,” said Gunny. Gunny maneuvers the cat down and over to chundery path, and we swivel left, rolling up to the second sponsored rail section, the GoPro features. This multiple-option feature has a 25-foot-long close-out rail into a 14-foot-tall by 26-foot-wide wallride. Tiered below the close-out rail is a takeoff option that gaps into the wallride. There’s also a staircase with a 12-foot flat to 18-foot down handrail and a 25-foot-long street rail. Four Aspen/Snowmass park crew members carefully sculpt the lips that will soon be the scene of hard-hitting action. They apply gradual force to the snow, time and again, to create the smoothest take-off possible. With the televised events a few days away, Buttermilk is already covered with throngs of people. 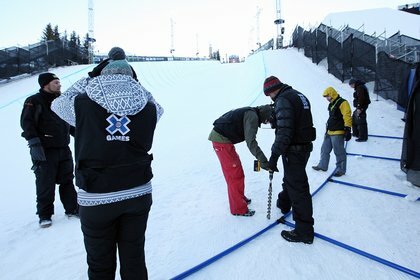 At full-bore, SPT has 15 of their own guys on-site, while over 1,000 people including the ESPN crews, Aspen Crews and volunteers work on site throughout the week to make the X Games a reality. Amidst it all, Aspen/Snowmass Terrain Park Manager, Greg Boyd, is coordinating his crew and juggling day-to-day operations at the Snowmass park. Following a few moments of awe at the size and scale of the slope course and the amount of work that goes into creating the beast, we spiral back toward the cat track to make our way to the base area. After 18 years of being the man behind the build of the X Games, I ask Gunny what keeps him stoked, year after year. All the cables have been laid, the camera angles checked, and scripts written for live-televised event that will pop off on ESPN this evening. Behind the scenes, there will be an army carefully tending the courses, ensuring everything is primed and perfected for the Winter X Games 2015. 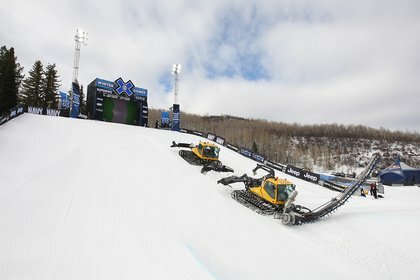 Whether you tune in on TV, or watch from the bottom of the pipe, remember the behemoth of the X Games takes months of planning and building, thanks to a dedicated crew just trying to keep the progression of snowboarding at the forefront.